Canary Wharf is always considered the business hub of London and it’s an area we’re all proud of. With the sparkling glass reflecting the ultra-clean streets and the best of modern architecture grouped together it feels like every city should. Without traffic congestion or crowding it’s difficult to imagine that in those mirrored towers millions of people work away every day. Of course, with the Apprentice back on the box, it’s even more current right now as some of the most famous opening scenes are shot on the bridges with the Gherkin and the Shard as their backdrop. Earlier this year, our client decided that the reflective qualities of Canary Wharf would highlight the AVM (around view monitor) of the Nissan Qashqai, showing how this feature could help you park any way, in any space, regardless of over population. I spent the small hours of the morning shooting around Canary Wharf, putting together elements in my head that would do the trick, but the results were worth every minute as it shows a panoramic view of the tightest spot in Canary Wharf. To shoot in Canary Wharf you pay by the hour, but it’s all for a good cause, as every penny goes towards the Canary Wharf Film Fund helping talented youngsters build a career in the industry. I was surprised at the efficiency of the security systems in place there too – being approached by security men at pretty much every location checking on what we were up to! Thanks to DNA London for giving us this project that brought us to the heart of British business. Back in the studio, we used clever tricks to place the Qashqai in front of the towers, manipulating the scene to highlight the functionality of the AVM. We built the scene around the car, moving in around it. 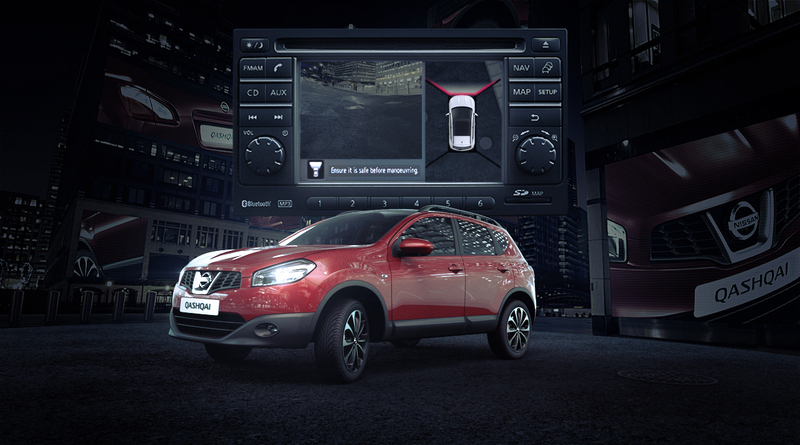 See the Nissan Qashqai blog here for how we developed the scene. This was a few months ago but today we’ve had some developments as we find ourselves back with the Qashqai due to the client’s demand. It turns out that they loved the perspective so much that they wanted to see the car and its AVM feature from the driver’s perspective and subsequently with a clean white background in the studio.